When he wrote a quick note Friday night to the Milwaukee media, John Axford was just trying to be courteous to explain his situation. And when I tweeted a quick photo of it early Saturday morning, I thought it was something fun my followers would enjoy. Neither of us had any idea the note would become as big a deal as it did. My tweet and photo soon were retweeted by Adam McCalvy, Derrick Goold, Richard Justice and Will Leitch, among others, including Doug Gottlieb, Tom Oates, Bleacher Report and USA Today. Thanks to their significantly larger followings, my photo reached thousands more users on Twitter. After tweeting the picture, I noticed a couple retweets, but simply went about my business writing my game MLB.com game story. It was, after all, 1 a.m., and I did have to be back at Miller Park in about nine hours. I drove home still thinking the Axford note was funny, but no big deal. Just before going to sleep, I checked Twitter on my phone and was surprised by the number of retweets. That surprise turned to shock in the morning. All told, between my tweet and others that RT’d with a comment, I had well over 500 retweets. At its height, there was an almost constant flow of mentions coming in to my account. It was overwhelming and by far the most attention I’ve ever received on Twitter. 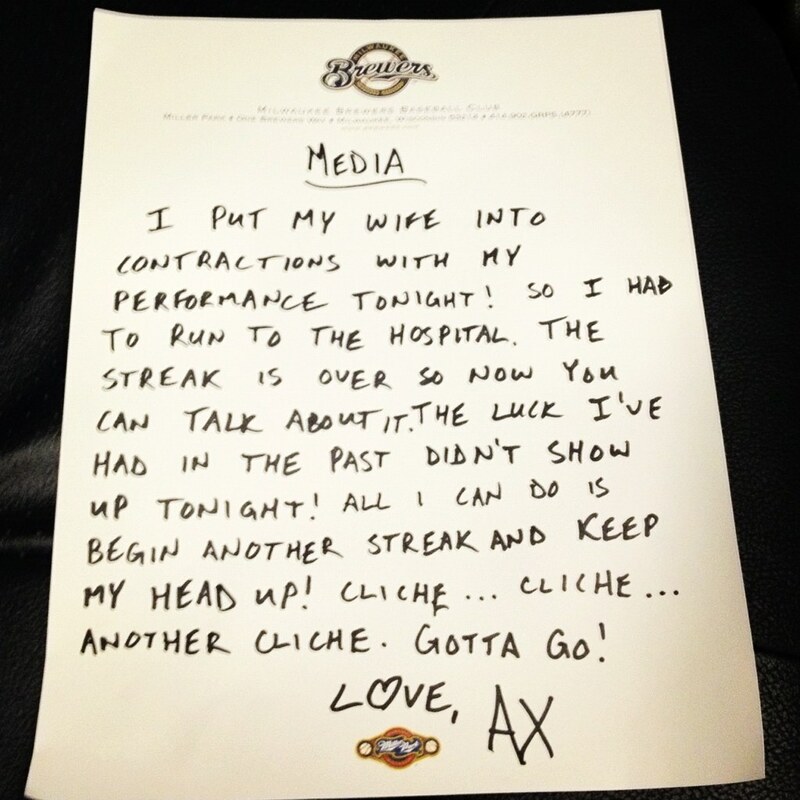 I owe much thanks to Axford for the note itself, as well as the high-profile writers that helped get my tweet out to the masses. I’m still just a freelance baseball writer, but it was fun to feel like more of a big shot for a day or two. MILWAUKEE — Even as the workload of pitchers decreases, the injuries seem to be mounting with increasing frequency. Especially elbow injuries, and especially with closers. That was the premise of a story written today by Tom Verducci for SI.com. As he sees it, the injury trends point to a need for rethinking the modern bullpen in which relievers — outside of a select group of long relief pitchers — are limited to single innings or at-bats in very specific situations. Left-handed relievers often face strictly left-handed batters late in ballgames. Managers like Tony La Russa have no problem running out three different relievers for three batters in a single inning: right-hander to face righty at the plate, lefty versus lefty, and then back to the right side. Or vice versa. The alarming thing is that while pitchers’ workloads are generally decreasing, the likelihood of injury seems to be on the rise. Just this week, Giants closer Brian Wilson went down with a season-ending elbow injury that will require his second Tommy John surgery. Sixty-six percent of 2011 Opening Day closers (20 of 30) are no longer closing for the same team 12 months later, with seven of them hurt. Injuries last year cost clubs $487 million — or about $16 million per team. The bill since 2008 for players who can’t play is $1.9 billion. As for guys like Wilson, going through the surgery a second time, 70 percent of relievers make it back while only one in 10 starters returns following a second operation and lengthy rehab. The past two seasons mark the first time since the save statistic became official in 1969 that nobody saved 25 games with 81 innings in back-to-back full seasons. Bailey, with the 2009 Athletics, is the only closer to do so in the past four years. Over the previous five seasons, 53 closers saved 25 games at least once. Thirty-three of them, or 62 percent, no longer are closing. With all that in mind, I talked this afternoon with Brewers closer John Axford about the story and the injury trends, to assess his feelings and level of concern about the likelihood of injury and seemingly short lifespan of pitchers in his role. Do the injury trends worry you at all? Do you ever think at all about the fact that as a closer you’re likely to have a short lifespan in the role? Did you ever talk to Trevor Hoffman about how he was able to last in the role so successfully for such a long time? Would the likelihood of injuries make you more likely to want to sign early if offered an extension? Another thing mentioned in the story is the setup of the bullpen and closers being limited to late-inning save situations, if it were up to you would you stick with that or pitch whenever high-leverage situations came up? Fifth-inning, sixth inning? Can you compare your arm now to what it was like before Tommy John surgery? Do you think there should be any concern in baseball in general about the increase in injuries despite the decrease in workload? How well do you know BrianWilson and what did you think when you heard he would be having a second Tommy John surgery? ST. LOUIS — There was a time when bringing in Kameron Loe and John Axford out of the Brewers’ bullpen was as sure a sign of a Brewers victory as anything. Things have gotten a bit more interesting lately, but when it comes down to it, Axford and Loe are the Brewers’ No. 1 and No. 2 options out of the ‘pen. If the game is on the line, it’s a pretty safe bet that one, or both, is going to pitch in the late innings. Lately, even a heavy workload and minor struggles have not been enough to deter manager Ken Macha from making the call for the right-handed duo. More often than not, that strategy has worked out. With a two-run lead through six innings Tuesday night, Axford and Loe combined for the final three frames as the Crew took the first of a two-game set from the Cardinals, winning, 3-2, at Busch Stadium. Part of the strategy being successful, Macha conceded, is getting honest assessments from the players about how they feel. The other part is common sense. “On Sunday, Axford said he was fine, but I wasn’t going to use him because he had been in two out of three days with a lot of pitches,” Macha said. Pitching for the seventh time in the team’s past 11 games — over a 12-day span — Loe recalled memories of his stellar month of June in Tuesday’s seventh, retiring the Cardinals in order on three groundouts and just 15 pitches. But the eighth inning was a different story. Just when Loe appeared to be back to his usual, dominant self, he gave up a pair of singles around a grounder to short, prompting Macha to call Axford’s number. Axford, called upon to pitch more than one inning for the ninth time this season — six of which have been saves — allowed a run on a wild pitch before escaping with the lead intact. In the ninth, Axford shut down St. Louis in order, securing his 18th save of the season. Axford picked up his sixth save of more than an inning in length in six chances and recorded his ninth appearance of four outs or more. In 36 games this season, Axford has yet to pitch less than a full frame. Loe and Axford closed out a stellar performance by right-handed starter Dave Bush, who cruised through six innings, giving up just one run — Albert Pujols’ 31st homer — on four hits and one walk with three strikeouts. Bush (6-10) left after just 91 pitches due to a blister on his pitching hand. Before that early exit, Bush kept the Cardinals’ hitters off balance all night, allowing no more than one baserunner in any inning. Garcia (10-6) tossed his 16th quality start of the season and fifth of no earned runs at home, giving up just three unearned runs on five hits over six innings pitched. The left-hander was roughed up in two innings, though, both of which were marked by Felipe Lopez errors. In the third inning, Lopez’s error proved costly. Brewers third baseman Casey McGehee belted a two-run homer to center field, which capped a three-run inning and proved to be the eventual game-winner. After a quiet three-game series in Colorado, McGehee was swinging as hot a bat as ever. Entering the game just 1-for-7 against Garcia with a walk and a strikeout, McGehee hit the ball hard up the middle in each of his three at-bats, including the two-run homer. McGehee’s second-inning single was ripped hard off Garcia’s left leg, ricocheting into foul territory on the third-base side. An inning later, McGehee belted his 19th homer of the season. McGehee has hit safely in 12 of his past 14 games, batting .411 (23-for-56) in that stretch with five home runs and 19 RBIs. In the 21 games since July 25, when he broke a homerless streak, McGehee has gone .370 (30-for-81) with six home runs and 22 RBIs. “It’s a whole [heck] of a lot of luck,” McGehee joked. “The biggest thing was just confidence, I think. For a while there, I was making it a little too complicated. 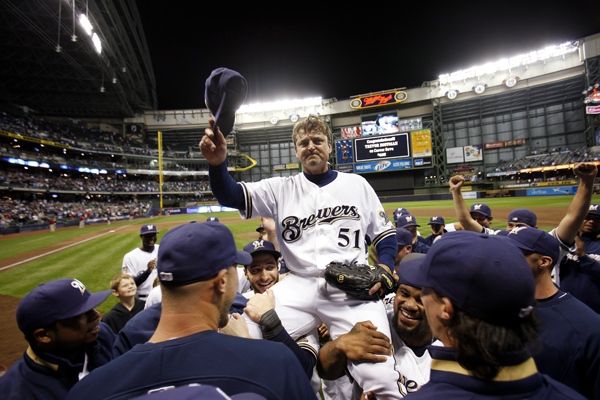 MILWAUKEE — It was the perfect ending to a great week for Corey Hart. A week after being named to his second All-Star Game, the Brewers right fielder capped the first half of the season with his second walk-off home run on Sunday. Hart, who had struggled through his first four at-bats of the game, crushed a 1-0 slider out to left off Pirates closer Octavio Dotel, giving the Brewers the 6-5 victory at Miller Park. “I was trying to see something and get a hit,” Hart said. “When I hit it, I didn’t want to be one of those guys that put my hand way up in the air, so I gave it the half finger because I thought I got it. Hart’s blast put an exclamation point on what is sure to be a memorable day for him, as he was named to the starting lineup of the National League All-Star squad as a replacement for injured Braves outfielder Jason Heyward. Afterward, Hart was all smiles after his team-leading 21st home run saved the day for Milwaukee and sent the Brewers into the All-Star break on a positive note. “They were giving Corey a lot of breaking balls,” Brewers manager Ken Macha said. “He finally got one up and didn’t miss it. That’s a nice ending to the first half. Not only did Hart give the Brewers the win, but the two-time All-Star also picked up the slack of closer John Axford. With the Brewers having tied the score at 4 in the eighth on a pair of singles by Ryan Braun and Carlos Gomez, the game was placed in Axford’s hands with the expectation that he would give the home team a chance to win in the bottom half of the ninth. Axford (5-1), who was pitching for the third straight game, gave up a pair of singles to open the inning, which was followed by a sacrifice fly to right, putting the Pirates ahead by a run. The first single, which came on a bunt by Ronny Cedeno in which he narrowly avoided a tag by first baseman Prince Fielder, was a call which Axford did not agree with afterward. “I thought Prince got him right on the heel, so did Prince,” Axford said. “I’m sure if you ask the umpires, they’ll say, ‘No,’ but if you ask them without a paper and pen and maybe a recorder, they might say that he was tagged. Axford escaped the inning when he snagged a ball hit back through the middle and started a crucial inning-ending double play. Though he was frustrated when he returned to the dugout, Axford reminded himself that his club was certainly capable of coming back again. Three batters later, he was right. Lefty starter Randy Wolf was not as sharp as he might have liked to have been, but he did just enough to keep the Brewers in the game. Wolf allowed four runs on seven hits over six innings while walking three and recording five strikeouts. For the second straight outing, Wolf had a solid start except for one bad inning — a three-run second frame. The only other blemish was a solo homer in the sixth by rookie third baseman Pedro Alvarez. “One rough inning,” Wolf said. “I left some balls over the plate, and they had a three-run inning. That last run. … I was successful all day with fastballs to Alvarez and he just finally caught up to one and he barreled it. Despite his lack of success early on — Alvarez was 0-for-2 with two strikeouts going into the at-bat — he stuck with it and gave his team the 4-3 lead. Along with Hart’s big blast, the Brewers got two more homers, solo shots by Braun and George Kottaras. For Braun, who continues to break out of a prolonged slump, the home run was his second in as many games as he went 5-for-8 with two home runs, five runs and three RBIs in the three-game sweep. After dropping five straight with some of their worst performances of the season, the Brewers head into the All-Star break riding a wave of momentum. “We feel better about ourselves, that’s a good thing,” Braun said. “It’s irrelevant to think about whether we’ve won four or five games in a row or lost four or five in a row.